Starting with its simplest part – the bottom – here in a view that looks east towards Capitol Hill, a nearly new Westlake Avenue intersects on a slant with 5th Avenue. 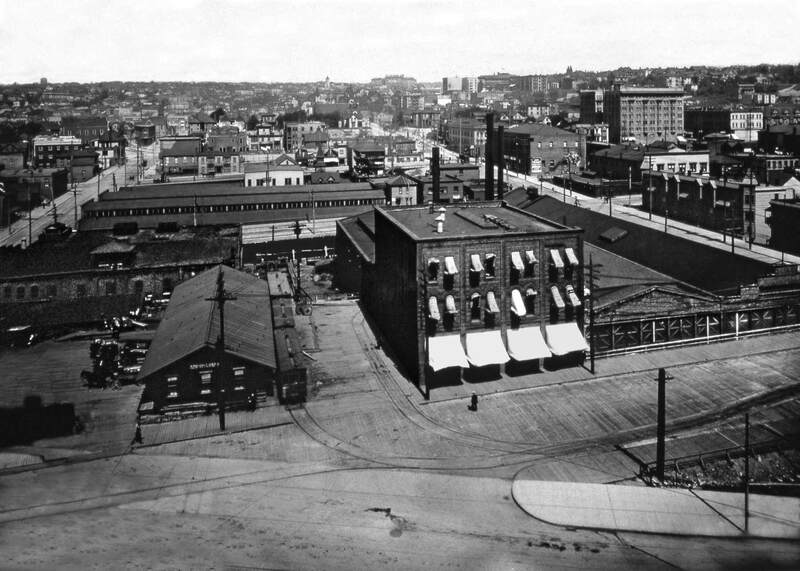 Next, on the far side of 5th the car barns and repair sheds of the Seattle Electric Company, once the city’s trolley monopolist, are half buried. 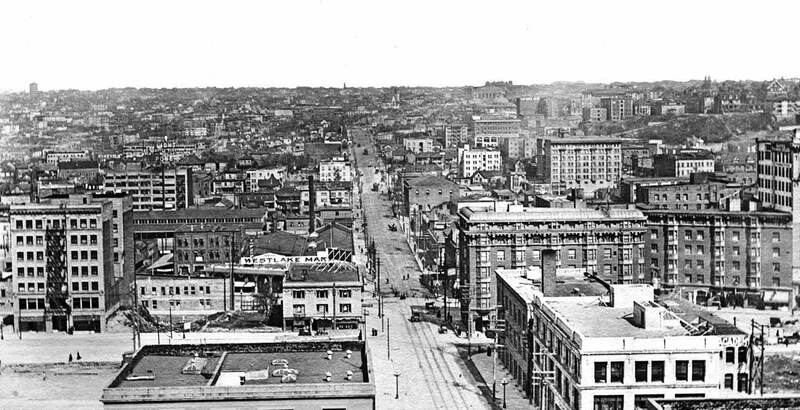 Pine Street on the right and Olive Way on the left, were both raised atop dirt “borrowed” from the nearby Denny Regrade. And so also by 1907 were most of the avenues showing here – from Fifth to Ninth. 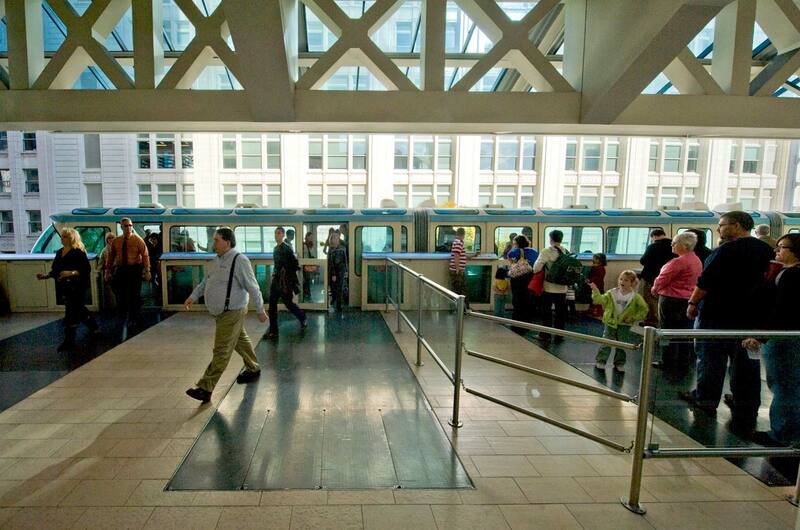 More than raised, Westlake – still at the bottom – was created or cut through the city grid from 4th and Pike to Denny Way, as we know it now. (Or rather as we knew it up until a few years ago when Westlake Mall and the rest were developed, in part, over the first block of Westlake, the part that ran from 4th and Pike on a slant through Pine to Olive.) That work began early in 1905 and was completed in November of the next year. Perhaps this view was recorded in order to show these street changes. Eventually a super-sized Westlake Market used these old barns to sell groceries. It was in competition with the Pike Place Market until evicted for the 1916-18 construction of the first five floors of the Frederick and Nelson Department Store. Looking east at the same neighborhood, but from the then new Standard Furniture big store at the Northwest corner of 2nd and Pine (Now the Rack). The seven-story Ritz Hotel, on the left, is the prospect from which the neighborhood photograph used above was recorded about two years earlier. Many other structures appear in both views. Here Pine Street leads east (up) into the center of the view. Looking south on 5th Avenue across Pine Street, 1909. With the last reprinting of Seattle Now & Then Volume 1, I returned to many of the subjects and updated their "repeats" including this look south down 5th Avenue into its intersection with Pine Street. Frederick and Nelson Dept. Store was still in place, although barely. This print and the one directly below it were both - I believe - photographed in late 1982 as alternative "repeats" for the 1909 dragon story when it first appears in Pacific, Jan 7, 1983. I cannot explain why I put myself to close to the intersection except, perhaps, to get closer to the pedestrians. 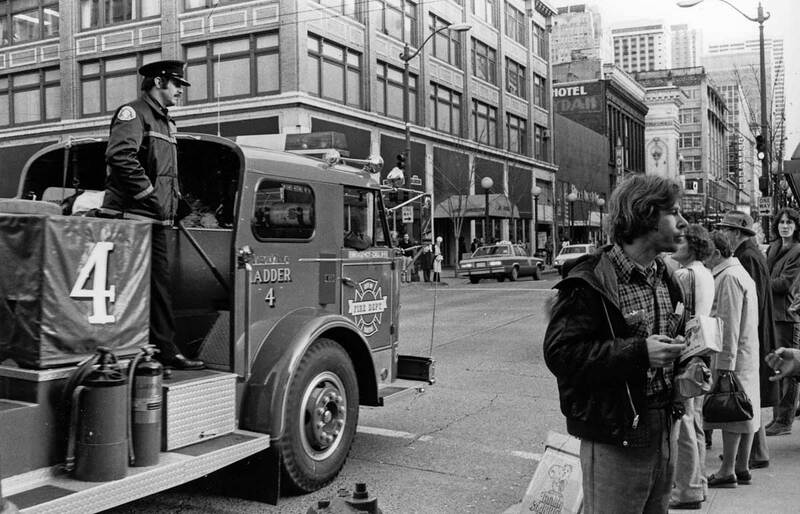 Looking south on 5th at Pine Street, also, most likely, in late 1982. Slaying a dragon is the single most heroic achievement – potentially crowning – for any European hero. Legendary champions have been rescuing damsels from the too hot embrace of these beasts and then putting down the girl to also plunder the treasures the beasts fiercely failed to protect. But in the East, the dragon is often different. It is the most persistent symbol of vital power, fertility and well-being. It is also ordinarily a vegetarian and inclined to share its carrots. However, in our scene of the Chinese dragon dance, we see the lead bearer carrying a staff tipped with a symbolic fruit. The dragon wants it, and will dance through many city blocks to get it. What, we also wonder, might the man in the European costume, on the right, be thinking. Could he be confusing this happy procession of the Asian monster with the fire-breathing histo­ry of its European cousin? Or could he be carrying beneath that derby another kind of demon? That old mean stereotype of the Chinese •‘coolie boy,” or the crude image of the opium-eating heathen, who worked more for less and then gambled it away. Those were the stock Euro-American responses to these Asian immigrants. By 1909, this attitude had resulted in more than a half-century of prejudicial treatment. First Asian immigrants were used as cheap labor to mine the gold and coal, build the railroads and do domestic service. Then when the work was scarce they were peculiarly taxed and prevented from owning property, gaining citizenship and sending for relatives and wives. Often they were railroaded out of town — both in Seattle and Tacoma in the mid-1880s — on the very rails they had laid. Here, on Fifth Avenue, some of them are back. Both their costumes and cut-back hairlines are from the Ching Dynasty, which in 1909 was in its 265th year, but with only two years to go. 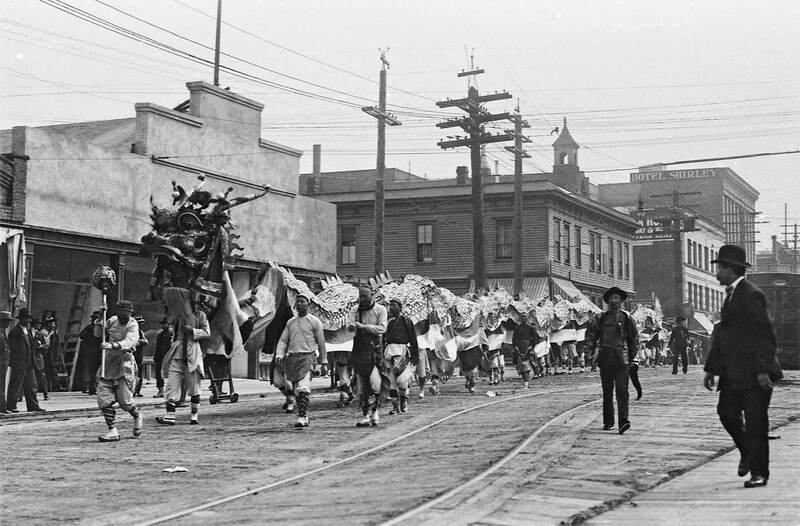 In 1911 demonstrators in Seattle’s Chinatown would replace the dynasty’s dragon flags with the new republic’s single white star floating on a field of blue and red. The design was inspired by the Stars and Strips. 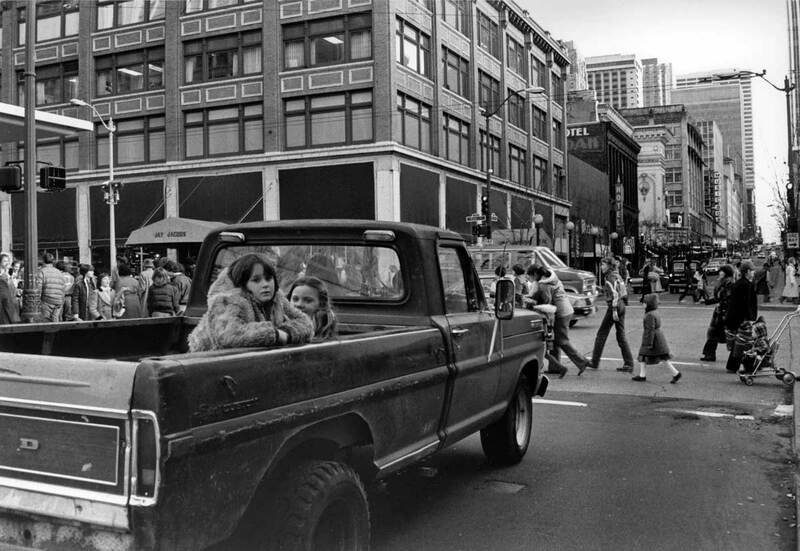 The bottom two of the three “semi-now” scenes above I photographed in 1982 crowded with Christmas shoppers. The top one for a reprint of Seattle Now and Then (the book) in 1997. The Westlake Public Market, behind the dragon’s head, has been replaced by Frederick & Nelsons Department Store (long since Nordstroms). Across Pine, the Olympic Stables and behind it the Methodist Church have left for Jay Jacobs. But the building, which in 1909 held the Hotel Shirley, is still a hotel. (Or was in 1982.) The dragon, of course, still can be seen dancing every Chinese New Year, although ordinarily not here on Fifth Avenue. I was confused when you said that Westlake started at 4TH and Pike, so I looked at Google Maps and I can see that it once did start there. That is the reason why the buildings on Westlake Park are built at an angle. So the section of Westlake shown in the “before” picture is no longer there. You did not mention that. Thank you for “Now and Then.” It has been the first thing I look at in the Sunday paper for many years. Today’s “Then” photo in Pacific Northwest Magazine appears to have no identifiable survivors. From your online version of the same photo, the Capitol Hill horizon is visible with a number of landmarks that exist whole or in part today. The Volunteer Park water tower (1907) and Broadway High School (1902) are the easiest to spot. The large structure to the right (with a windowless wall) is the newly completed Wintonia Hotel. Can you identify the building with the large flagpole just south of the Wintonia? Do I also see in both versions, what appears to be the intersection (with trolley tracks) where Howell St. veers away from Olive Way at 8th Avenue? First off, thank you for this blog and all the great work you people do. Secondly, in the caption to the 1st blog addition photo there seems to be two mistakes. The Standard Furniture Building is located at Second and Pine. 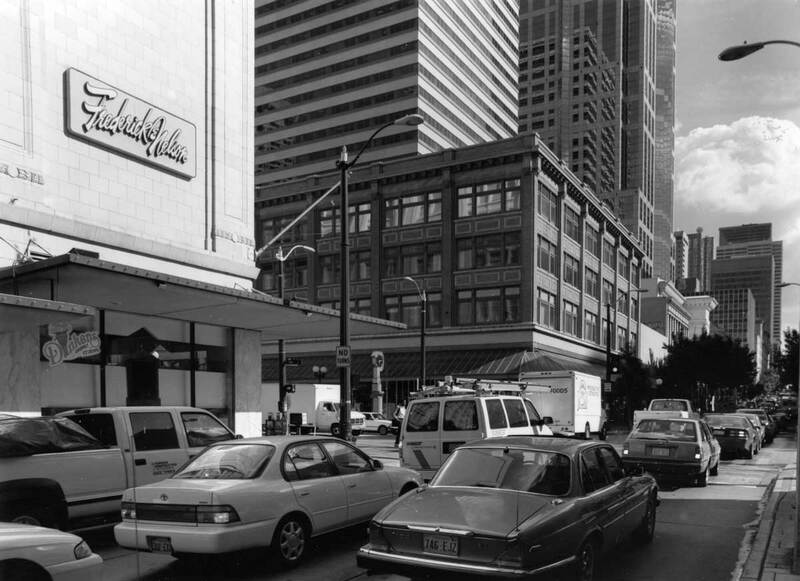 It is where the Nordstrom Rack is now located the Gap store is currently located at 5th and Pine. Dear White4house: I do rather live in the past and still imagine that Westlake is only temporarily vacated for development, although I do know better. I mean in its original configuration as built or cut through in 1906 from the five star at 4th and Pike. Dear David: Yes for reasons perhaps not beyond the general “fight for inches” in that magazine, the horizon line was cut away. I don’t think they needed to do that, but I learned long ago not to complain about such stuff. When you write “large structure to the right (with a windowless wall) is the newly completed Wintonia Hotel” do you mean to write the Waldorf hotel? Or do you mean Wintonia. I did not mention it in the article so you have a lot of faith in me to know what your are writing about. I remember the rather raunchy rock bar in the main floor of the Wintonia in the 1970s. Lance Romance played there a lot. It was famous for wild pool table exhibitions. Yes the Wintonia is in the above pixs but up a few blocks at the corner of Minor and Pine. While I don’t see a flag pole to the right of the Waldorf at 7th and Pike, I do see a faint one to the rigth of the Wintonia, and that, I believe, is Summit School, or was until the name was changed when it became a private school for parents who were, in part, worried about preparing their children for competitive higher education and willing to pay for it. It is The Northwest School now? Much earlier and briefly, beginning in the late 1880s, it was the site of Grace Hospital, the Protestant’s failed attempt to answer the cheap and popular care of the Catholic Providence Hospital. Nuns work for less. (I’ve written about both the school and the hospital in separate pieces and may get them in here sometime in the future – but where else?) Yes you do see at mid-distance left that unique intersection where Howell originates out of Olive Way at 8th Avenue. Many years ago I wrote a piece on the flatiron-shaped frame building sitting there. Another one to revive when there is time and/or people cry for more flat iron stories. R.V.B. Sorry. I’m a sleep-walking consumer and don’t even read ads anymore. I should be less sloppy. I meant the Rack not the Gap. I have even shopped at the Rack – for shoes, I think, about fifteen years ago. As for Pike not Pine. I plead late night decisions to go on blogging rather than sleeping and the sloppy self-review or no re-read that resulted. Of course, I did knew that this was Pine not Pike, which is sort of obvious because of all the other “internal evidences” in the article(s). But I typed Pike. (My other excuse is age.) I’ll make the corrections now.